At least 19 foreign tourists, including two Britons, have been killed in Egypt after a hot air balloon crashed near Luxor.Officials said that there was a fire and an explosion causing the balloon to plunge several hundred feet from the sky and crashed into sugar cane fields west of Luxor, about 320 miles south of Cairo, the Egyptian capital. Two British were said to be among among those killed, with nine Chinese citizens from Hong Kong, including five men and four women from three families, four Japanese, two French, one from Korea and a local Egyptian female. The two survivors, including the pilot were rushed to hospital suffering up to 70 per cent burns to their bodies. Witnesses described hearing a loud explosion, which shook homes, and thick black smoke, with some passengers jumping for their lives from the equivalent height of an seven-storey building. It has been suggested that a gas cylinder exploded mid-air just after 7am local time. Witnesses counted eight bodies as they were put into body bags and taken away. He said: “I heard a loud explosion and turned around and saw black smoke coming from a balloon behind us. Out pilot then became very disturbed. He said ‘this has not happened in a very long time’. “I wasn’t sure what had happened and it became clear when we landed. There was a general feeling of shock and sadness. You can’t imagine how the other people in that balloon must have been feeling. Cherry Tohamy’s balloon saw flames from a balloon above when she landed. “Our pilot told us that the balloon had hit a high pressure electrical cable and a cylinder on board exploded,” said Ms Tohamy, an Egyptian living in Kuwait who was on holiday in Luxor. Konny Matthews, assistant manager of a Luxor’s Al Moudira hotel, said she heard a boom around 7 am local time. She said: “It was a huge bang. It was a frightening bang, even though it was several kilometers away from the hotel. Ahmed Aboud, a spokesman for companies that operate balloon flights in the area, added that one tourist and the balloon pilot had survived the accident, which happened after a gas explosion at 1,000 feet. He said the tourists were from a variety of countries but did not immediately have information on their nationalities. “There were 20 passengers aboard. An explosion happened and 19 passengers died. One tourist and the pilot survived,” said Mr Aboud a representative of eight companies that operate balloons in Luxor. General Mamdough Khale, director of security for Luxor Governate, said that Luxor International Hospital had received 19 badly burnt bodies. A crash eyewitness and employee for sky cruise told France24 that the pilot was good and the crash would not be his fault. Ezzat Saad, the governor of Luxor, told Nile News that the Egyptian pilot of the balloon was in the hospital with 70 per cent burns. Luxor, which lies on the banks of the Nile, is home to some of the country’s most famous ruins, frequently dubed the “world’s greatest open air museum”, with the ruins of the temple complexes at Karnak and Luxor within the modern city. Hot air ballooning at dawn is popular with tourists who go to Luxor to visit its pharaonic temples and the tombs of the Valley of the Kings, including in Tutankhamen’s. Twitter: Jonathan Aspinwall – Been on a similar hot air balloon trip in Luxor a few weeks ago. Very popular with UK tourists who get up at dawn. A Foreign Office spokesman said they were aware of the reports and were making urgent inquiries but could not immediately confirm the number of Britons involved. 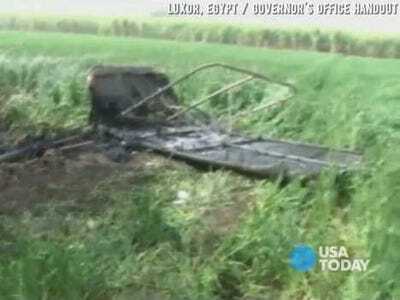 In 2009, a hot air balloon carrying British tourists over Luxor careened out of control and into a mobile phone mast, ripping through the fabric, before crashing some 30 feet to the ground. Sixteen tourists were injured, some of them seriously, as they were thrown from the wreckage. It led to flights over the Valley of the Kings being suspended for six months while safety measures were tightened.